Growing Up Geeky: Geeky Find Friday - Teeny tiny jellyfish, squeee! Geeky Find Friday - Teeny tiny jellyfish, squeee! 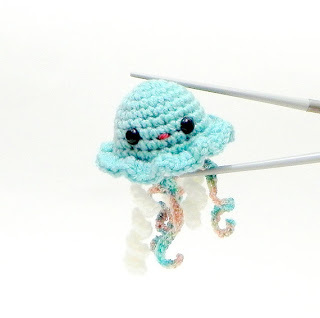 This miniature jellyfish makes me want to squee all over the place. And then buy the rest of the cute tiny things in the Etsy shop. I seriously need all of these. This MochiQtie is hand crocheted stitch by stitch with various types of yarn, filled with premium quality and non- allergenic fiberfill. Safety eyes attached. Not edible, but MochiQtie will be a fun pal to keep around! MochiQtie can be hanging around your bag, home, desk, trees, anywhere! Haha! I agree! He is simply adorable! No wonder he was gone so fast!